At a Faculty Senate meeting earlier this month, Provost Forrest Maltzman said GW has expanded the types of programs it offers to meet the needs of students more interested in a professional career. Like many in her field, Keylie Gibson, a doctoral candidate in GW’s Computational Biology Institute, has no interest in a career in academia despite her advanced degree. The idea of working in a federal crime lab is much more appealing to her than the stress of teaching courses or applying for grants, she said. “I think the only way I would go into academia would be as a researcher at a university, where I don’t have teaching responsibilities, but even then working for a university does not appeal to me,” she said. Gibson is part of a growing number of doctoral candidates eschewing careers in academia over limited job prospects or lack of interest. With companies in many industries seeking out students with advanced degrees, experts said those students have plenty of career options outside the academy. 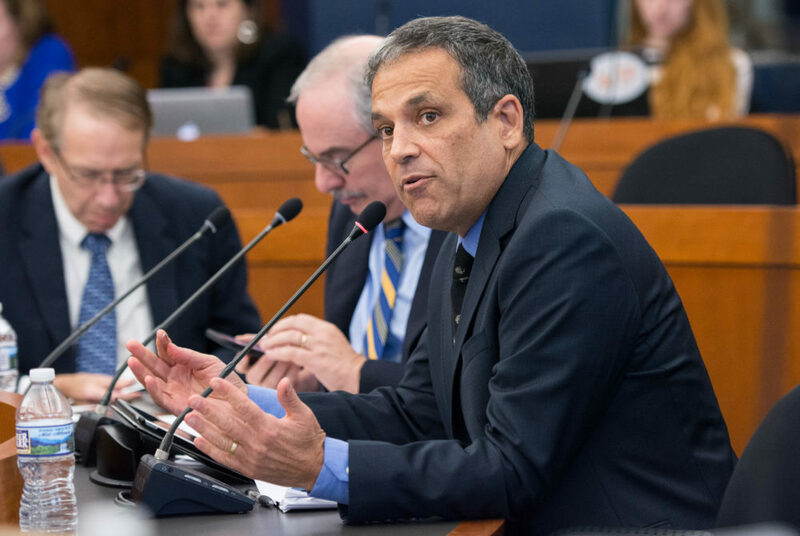 At a Faculty Senate meeting earlier this month, Provost Forrest Maltzman said GW has expanded the types of programs that it offers to meet the needs of students more interested in a professional career outside of academia. He said the University has moved to accommodate those students in recent years by offering courses in different mediums and allowing “multi-essay dissertations” in some programs. These are “essentially separate journal-style articles” rather than a traditional dissertation. As of February, there were 14 doctoral programs offered online to about 271 students, according to a recent Faculty Senate report. Maltzman said there are certain fields like political science, economics, psychology or English where most students are still interested in a traditional Ph.D. experience of studying full-time and working closely with a faculty mentor on a dissertation. But he said students pursuing doctorate degrees in fields like education, engineering, public health, nursing or physical therapy are often part-time students with a professional focus who are more apt to take hybrid or online courses. Maltzman said professional doctoral degrees, which focus on a non-academic skillset, would rise in popularity as advanced technical skills become increasingly in demand in the corporate world. GW and schools nationwide have been impacted by this shift in interest from doctoral candidates. A recent study by Cornell University found at least one-third of scientific doctoral students are losing interest in careers in academia. Students and experts said the shift is likely linked to limited job growth in academia and extended opportunities in other fields. At GW, the number of tenure-track hires has slowed and been outpaced by the growth of non-tenure-track faculty each year since 2013. Colleges nationwide have turned to adjuncts as a way to cut ballooning budgets. As students learn more about both their own interests and prospective careers, researchers said they may decide to pursue different career paths, like research or hands-on positions in labs. Michael Roach, an assistant professor entrepreneurship at Cornell University who helped conduct the study, said much of his research involved exploring shifting career preferences and how they changed during graduate training. Roach said students are now likely to pursue a Ph.D not because they want to go into academia, but because many advanced fields – particularly in science, technology and engineering – require an advanced degree. “I think that the bigger issue is not so much a concern that people are losing interest but that the way universities are structured and they way we train graduate students is that we don’t do a lot to help educate Ph.D.s about non-academic careers and to prepare them for non-academic careers,” Roach said. Graduating doctoral students also struggle to find jobs in a market where opportunities are shrinking even as the number of Ph.Ds awarded grows each year, according to an Inside Higher Ed study. Thiago da Silva Moreira, a biology doctoral candidate, said he has been interested in a career in academia since he was an undergraduate but he had never really been aware of other options until recently as the job market has shifted. Moreira said the increasingly scarce availability of professor jobs is worrying, especially because his speciality means that many of his career opportunities may only be in academia. “Especially in my field of study, which, in quoting the words of my adviser, skills that are highly trained and honed in on in your Ph.D. are not very useful outside of academia,” he said. Igor Efimov, the chair of the biomedical engineering department, said students in his lab are evenly split between going into academic and industry positions. He said corporations have shown a greater interest in hiring professionals with a Ph.D. in recent years because they have more training and specialized skills. “Ph.D education is currently required for so many other professions that, basically, all these opportunities became available to students,” he said. Herman Aguinis, a professor of management in the School of Business, said the shift to professionally-focused Ph.D. programs goes against what these programs are designed to achieve. He said it is rare for his graduate students to avoid an academic career after obtaining their doctoral degree because it is generally understood that doctorate degrees segue into teaching careers. “We do not train students to go out there and make money for the corporate world, we train students, we give them all the resources, and we expect that they will become professors themselves,” he said. This article appeared in the October 26, 2017 issue of the Hatchet.